Last week we received a phone call from a university that was looking for a professional Microsoft Excel consulting services firm to help them with their Microsoft Excel applications. They were specifically looking to hire an Excel consultancy that had experience working with educational institutions (colleges). So on the call she asks us, “do you work with colleges”. The response she was given was this, “yes, we have worked with dozens of colleges over the past 23 years, from Harvard and Thunderbird to UCI and ASU“. She liked that and after a lengthy conversation and project discovery we submitted our quote and she is now a happy Excel client. So that got me thinking. How can I get the message out there so that the potential clients see it right away? I already use descriptive verbiage on the site, but I needed something more. I needed a page that lists the better known educational institutions we have worked with since 1994. And that meant I also needed a new graphic that tells the tale without reading a word. So I created the page, here is the link to our educational institutions page, and I created the graphic below. So if you want to find the educational institution (Colleges) page, as well as our other industries we work in, click here. While we have worked with some well known and amazing colleges, such as UCSD (University of San Diego), most of the colleges we have worked with are not know to people outside the area, nor are they on the educational institution page on this site. They are also not on the college graphic you see above. But the number is substantial. We have been in operation since 1994, two to ten times as long as our competitors, and over those 23 years we have racked up quite the list of clients and unmatched experience which has taken our Microsoft Excel and Access programming skills to the highest levels. 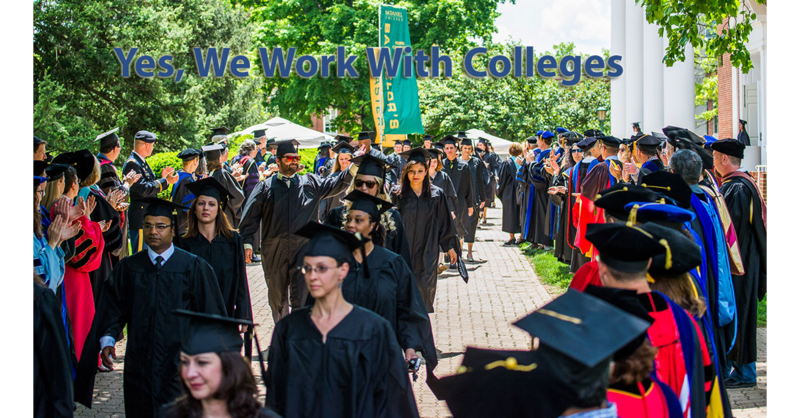 How do we assist our college clients? The work we have done for these colleges is not that different than the work we have done for our business and government clients. Most of them hired us for our Excel or Access programming skills. A few for PowerPoint, Word, Visio and Outlook. The CFO at Charles Drew University for example has hired us several times. Our work for them involved integrating and automating these applications, Excel, Access, and SQL Server. This client worked with two of our Microsoft Excel MVPs to work with him. The work we did for him was similar to our work for Kaiser or Tenet Healthcare. Thunderbird School of Business Management hired us to come onsite for two days to provide Microsoft Excel and PowerPoint training to their students. So the work we do for educational institutions is not all Excel programming, some of it is actually Excel and Access training. Does your collegiate organization need help? Want to discuss your needs? If you are an educational institution and you need help with any of the Microsoft applications, be it consulting or training, we have you covered, at the expert level. For a FREE Consultation to discuss your educational institution needs please reach out today. We can help you just as well as we help our business and government clients. Posted on April 28, 2017 Posted in Blog Category and tagged Power, California, Training, Microsoft Office, Irvine.